I love a good manifesto. As the Merriam-Webster dictionary says, a manifesto is “a written statement declaring publicly the intentions, motives, or views of its issuer”, and I believe that a well-written manifesto can communicate core beliefs, inspire others and deliver a powerful, resonant message. Looking around the Internet there are some great manifestos. Let’s start with one of the more famous examples: The Holstee Manifesto which was created in 2009. I believe this is so famous because it contains so much wisdom. There is so much in this manifesto that resonates with me. In particular the statements: “This is your Life. Do what you love and do it often” and “Live your dream and share your passion” are my motivators for creating Frugalitude! 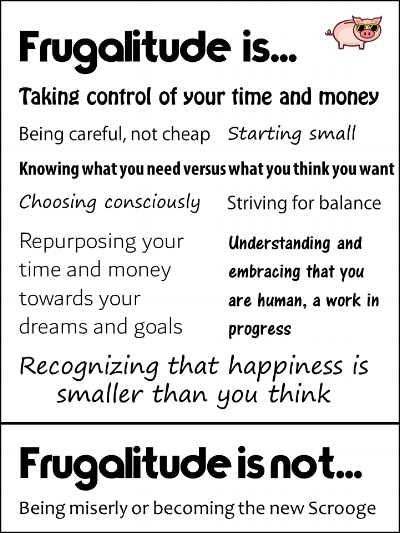 Like the Holstee Manifesto, Lululemon uses mixed typography in their manifesto to communicate the core beliefs of their brand. While I like a lot of the concepts, I'm not sure that a company really believes that "friends are more important than money", especially when paying for their products. And there are some who believe that this is just a cynical way for the company to cash in - check out this amusing Lululemon manifesto parody. Then there is this manifesto from the International Institute of Not Doing Much. I love the idea of slowing down to live in a state of calm. In my opinion slowing down is also the key to savoring life more. I know that I definitely feel calmer and less stressed when I am able to take more time. 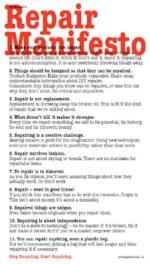 Another great example is the environmentally-friendly Repair Manifesto which has wonderful concepts like “Making repairs is good for the imagination” and “Even fakes become originals when your repair them”. And it is another environmentally-friendly alternative to recycling. Lastly, there is the Expert Enough Manifesto. I do believe that most of us underestimate what we are capable of and this manifesto is a great reminder to just get out there and do something. It doesn't matter if we're not the best or if something doesn't go right - it's just an experiment! And here it is again, but is a fancier format! What do you think? What’s missing? What resonates with you? Want to know more about Frugulitude? Then check out “What in the world is Frugalitude?”.